Beef bowls (gyudon) are known for their affordability and convenience. At Hiroshige in Kobe, however, customers line up for an hour and a half to try mouthwatering beef bowls made with Kobe beef! We introduce what goes into making this delicious dish. An Amazing Beef Bowl Worth Waiting For! Gyudon (beef bowl) is a popular dish in Japan. 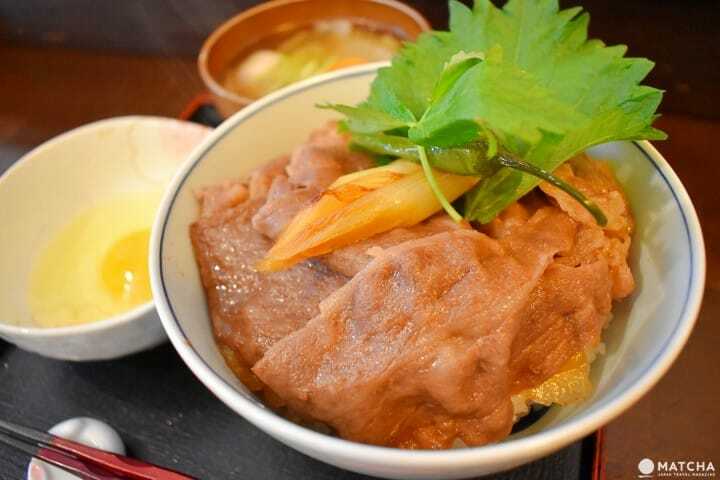 It consists of beef and onions simmered in sweet sauce containing dashi stock, soy sauce, Japanese sake, and mirin (*1). The beef and onions are then topped on a bed of rice and eaten together. At chain restaurants, most gyudon is served in less than a minute after you order it, and a bowl costs a few hundred yen. However, this time, we are introducing gyudon that is very different than what is offered at chain restaurants. At this establishment, it will take about an hour and a half until your gyudon is served. The price here is a little more expensive than a regular bowl, as Kobe beef is used! Each bowl here is made individually by a former Italian chef. This article introduces Hiroshige’s mouthwatering gyudon, which has attracted fans internationally. *1: Mirin is alcohol made by adding glutinous rice and rice malt to spirits and then fermenting the mixture. It is often used in Japanese cooking. Gyudon Hiroshige, which offers this beef bowl, is ten minutes on foot from Sannomiya Station in Kobe. Not limited to weekends, lines form at Hiroshige even on weekdays. The restaurant has a laidback environment and there are only ten seats at the counter. Hiroshige keeps a simple focus: the only thing on the menu is gyudon. The menu is only in Japanese, but all you have to say is “futsuu” (regular) or “o-mori” (large). The regular size is 1,300 yen and a large is 1,500 yen. We recommend getting a raw egg (100 yen) to top your bowl. All prices are tax-inclusive. The sole employee is the owner, Hiroshige Hishii. He handles every step by himself, from preparation and cooking to serving the gyudon. Once he gets an order, he starts to prepare the beef. He is meticulous about the time the meat is cooked for, and the precise cooking temperature. He prepares onions and other vegetables by stewing them for several hours beforehand. The cooking time for vegetables is variable as well, depending on the season. The cooking process, temperature, and time are methodically calculated, in order to draw out the potential of each ingredient as much as possible. Mr. Hishii says, “I don’t use any special seasonings. I don’t want to add too many spices and tamper with the meat's flavor.” The gyudon uses classic flavorings of soy sauce, sake and mirin. He does add one special ingredient. That ingredient is kanzuri. Kanzuri is a traditional fermented red pepper spice produced in Niigata. It’s made by pickling red peppers in salt, bleaching them in snow, then letting them ferment. Kanzuri is not typically used in gyudon. The addition of kanzuri gives the gyudon a light heat and strengthens the flavors. The bowl is cooked masterfully and simply seasoned, made delicious by removing extraneous ingredients. Time to Eat Kobe Beef Gyudon! It’s almost a shame to eat it, but we had to indulge. 2: Mitsuba and oba are edible perilla plants. The fragrant leaves are used as garnish or condiments. Mitsuba is from the parsley family, and is often used as to add color to rice bowls, soups, and other dishes. The more you chew, the more you will taste the characteristic rich flavors and sweetness of Kobe beef. The meat is the perfect amount of tenderness. The gyudon uses chuck roll, a cut of beef from the back of the cow containing high-quality fat with a distinct flavor. As we were absorbed in our meal, Mr. Hishii advised us to dip the beef in egg. Mix a raw egg into the beef, so you can enjoy it like sukiyaki. Rather than adding the entire egg directly on top of your gyudon, this way better draws out the flavor. The egg yolk mixes with the beef, giving it a milder and sweeter taste. The onions hidden under the meat are juicy and have a natural sweetness that make it easy to scoop up your meal. The Koshihikari rice has a nice texture with distinct grains. The onions, eggs, and Koshihikari rice are all sourced locally from Hyogo Prefecture. Add some shichimi (*3) on the table to your bowl and you can enjoy a different flavor. *3: Shichimi is a blend made of togarashi chili pepper, Japanese pepper, and other spices. Miso soup usually comes with with a classic gyudon meal. However, Hiroshige serves pot-au-feu style soup. “I want people to eat their daily allowance for vegetables, which is lacking in gyudon,” Mr. Hishii says, showcasing the former Italian chef’s consideration for customers. The pickled cucumbers are homemade and a perfect and refreshing palate cleanser. The melt-in-your-mouth gyudon, mild pot au feu, and refreshing pickles enveloped us in happiness. We polished off our meals in an instant. Mr. Hishii, the owner and chef, used to be an Italian chef. He opened a restaurant in Kobe at the young age of 22, and continued to work hard in trade for almost 20 years. However, due to a variety of difficult circumstances he had to close his business. “I decided I wanted to reset and do something completely different.” Mr. Hishii decided on the complete opposite of fine Italian dining: gyudon. Have a Tasty Meal You Should Get in Line For! Hiroshige opened in 2012. Even without any advertising, word spread about the restaurant. The restaurant is well-known not only in Japan, but also has repeat customers who come from overseas every year. Art from famous ukiyo-e artist Hiroshige Utagawa, hangs on the wall, which shares the restaurant name. Mr. Hishii has a different kanji for his first name, which is also Hiroshige. “I was embarrassed to use my name for the restaurant, but I thought it would feel like a vintage establishment that way,” he tells us, chuckling. Mr. Hishii may look intimidating, but if you talk to him you will find him to be a very friendly person. Mr. Hishii makes gyudon from morning until the evening, as his customers constantly line up outside. “There are lots of visitors who come from overseas. I want to welcome each of them properly, but there’s only one of me, so it's quite difficult,” he says wistfully. Even if he can’t talk to each customer individually, his consideration shows through the gyudon he serves at Hiroshige. Customers who were chatting fall silent once they start eating. Each person looks like they’re having a dialogue with the bowl in front of them. We went on a midsummer day to Hiroshige, Mr. Hishii spoke to each customer as they were leaving. Even on the midsummer day when we went, there was a long line of people outside, wanting to eat gyudon. Most days, there will be a line outside the door, and the average wait time is about an hour and a half. We recommend lining up early, or even before the restaurant opens if possible. In the summer make sure to hydrate and come dressed warmly in the winter. Hiroshige shuts down when everything is sold out. It’s common at lunch for people who are in line around 1:00 PM to be the last ones served, and for people who are in line around 8:00 PM to be the last ones in at dinnertime. On some days, everything is sold out by lunchtime and the restaurant will not be open for dinner. 3. You cannot make reservations. Hiroshige is a ten-minute walk from Sannomiya Station, the central area of Kobe. The street on the left-hand side is the Kitanozaka area, which leads to the Ijinkan, a well-known sightseeing spot. Hiroshige is not on Kitanozaka, but on the street on the right-hand side, soon after you enter. Peanuts Hotel opened in August 2018 on the same street as Hiroshige, and the area continues to develop, with new stores popping up. Hiroshige is 10 minutes from the Ijinkan area, so we suggest a visit there as well after your meal. Just be sure to give yourself plenty of extra time for your meal!